Montreal’s glittering, ruthless, post-war underworld. Austrian aristocrat Franz Loebek lands in Canada penniless, having lost everything in the violent upheavals brought by the Second World War. In Montreal he finds the Old World sophistication of London and Paris mixed with the youthful vibrancy of New York. But Loebek’s adopted city is an open city, and he unwillingly becomes drawn into the violent underworld of illegal gambling, all the while maintaining a front as he moves amongst Montreal’s most privileged. Gambling with Fire is the story of one man’s struggle to navigate illicit and dangerous waters to finally find stability and peace. Originally published in 1969, Gambling with Fire followed The Crime on Cote des Neiges (1951), Murder Over Dorval (1952) and Body on Mount Royal (1953) as David Montrose’s fourth and final novel. The author died while it was in production. This Ricochet Books edition, the first in forty-seven years, marks its paperback debut. 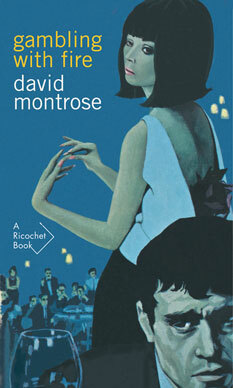 David Montrose was the pen name of Charles Ross Graham (1920-1968). Born in New Brunswick, he was raised in Nova Scotia, where he attended Dalhousie University. Further studies at McGill and Harvard were interrupted by service in the Canadian Army. Most of Graham’s adult life was spent in Montreal, where he eked out a living writing and teaching. John McFetridge was born and raised in Montreal. He is the author of six novels. His Constable Eddie Dougherty series, Black Rock (2014) and A Little More Free (2015), has been described by Publishers Weekly as “a fine character study, and a vivid snapshot of 1970s Montreal.” He currently lives in Toronto with his wife and two sons. 240 pp 7" x 4.25"